Finished Basement Flooring: Then and Now | News and Events for Basement Systems, Inc. 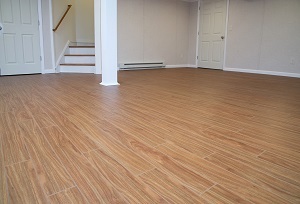 Basement flooring has made some huge advancements in the past few years. Whether you want wood, carpeting, tile, or just a sub floor, we have some fantastic advice for you about how to get the most value for your money. Read on to see how you can improve on popular trends with flooring options that are safe for the basement! One idea for a basement floor that appeals to many homeowners is to add the time-honored beauty of stone, ceramic, or marble floor tiles to their finished basement. At a glance, this sounds like a great idea. These tiles are installed with grout, which can grow bacteria, mildew, and mold and must be maintained annually. The tiles bond to the basement floor, so they’re hard, cold, and unforgiving. Removal of tiles from the basement floor is expensive and nearly impossible, as you’re trying to remove grout from cement. Yes, they’re gorgeous. But don’t you also want a welcome environment, a warm surface underfoot, and the option to change your mind about your basement flooring someday? Instead of committing to a lifetime of hard, cold tiles made of stone, ceramic, or marble, consider installing equally attractive plastic ThermalDry® basement flooring tiles. These tiles click together and install as a floating floor on your basement concrete. There’s no need to keep everything you’d stored in your basement upstairs for days while you wait for the grout to set- they’re ready to use immediately after installation. Basement floor tiles rest on raised pegs, creating an air space beneath. This space ensures that moisture will not be trapped beneath, and it creates a thermal break, making the surface of the tiles 8-10 degrees Fahrenheit warmer than the cold concrete below. Their plastic design makes them more forgiving of falls and dropped items, and should you ever want to remove them- the can be pulled up easily, with no need to scrape away grout. Wood finishing on a basement floor is among the worst possible finishing options there are. Wood soaks up moisture from the concrete floor beneath like a sponge, causing them to swell and buckle from moisture underneath- where dehumidifiers can’t reach it. If there’s ever a basement flood, water will be trapped in the wood as well. Mold can start to establish itself in a wood floor in just 24-48 hours, and once it’s begun, it’s expensive and difficult to stop it. We’ve seen hundreds of basements with ruined wood floors! Height in a basement finishing plan is critical, and wood flooring doesn’t help. Wood basement floors take up as much as 3-4″ of head space, which is sometimes just enough to make the basement not code-compliant for basement finishing. And if your wood floors are ever ruined and need to be removed, you can bet it’s going to be hard to find a contractor willing to rip out your old, moldy, rotting lumber, drag it out of the basement, and dispose of it. Admittedly, there’s nothing as warm, inviting, and attractive as a beautiful wood basement floor. However, there are options for basement flooring that can be installed without taking up several inches of your valuable head room, without being damaged by moisture, and without the risk of having to rip out and replace your basement floor should a basement flood occur. Products such as Basement System's ThermalDry Elite Plank Flooring and MillCreek wood laminate basement flooring do just this. Warranted to be 100% waterproof, these products won’t be damaged by a basement flood, and their design is more durable and long-lasting than a wood floor. ThermalDry plank flooring is an inorganic flooring option that simulates the look and texture of a real wood plank floor. It is available in a light and dark color so you can choose the wood floor look that most resembles the floor you're after. Unlike a wood sub floor, MillCreek only takes 1/4″ of a basement’s head space, leaving you more vertical room in the finished basement. And because it installs as a floating floor, there’s no adhesives to peel, and removal of the flooring is easy in inexpensive. There’s only one basement flooring material that soaks up moisture more than wood- carpet. 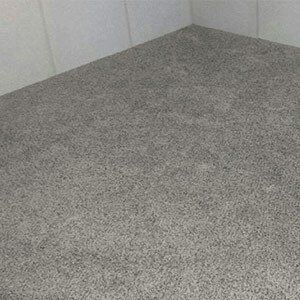 When placed on a basement floor, carpeting pulls in moisture like a sponge until it’s completely soaked. One flooded basement, and you can count on a moldy, musty odor in your finished basement for years to come. If a basement carpet is laid directly on the floor, then it’ll also soak up moisture and humidity passing upwards from the concrete below. And because it’s laying directly on the cold concrete, it’ll also be cold and uncomfortable underfoot. If it’s laid on a wood basement sub floor, then you have all the problems of wood floor combined with a moldy, rotting carpet. And because you’ve installed carpeting, you’re committed to a long, unbroken sheet on your basement floor. This means that any stain, tear, or worn spot is permanent. Instead of installing carpet on a sub floor or directly on the concrete itself, find a basement flooring option that will act as both a sub floor and carpeted surface. The ideal solutions are Pro Comfort Carpeting and ThermalDry Basement Floor Tiles. Pro Comfort Carpeting is plush, inorganic, and odor free, and their design gives you the appearance of continuous carpeting while having the benefits of a modular design - if one section is damaged, they can easily be replaced. ThermalDry carpeted floor tiles are a basement sub floor and finished floor surface in one. They interlock to prevent humidity from rising upwards into the basement, while they are completely waterproof and will not support mold growth. If you have your heart set on your own carpeting design, a plastic sub floor can still help. ThermalDry basement sub floor matting or ThermalDry® Insulated Floor Decking™ will double the life of your custom basement carpet! Are you ready to see how a new basement floor can transform your home? Or are you in need of help with any other areas of your basement? Your local Basement Systems dealer can take a look and help you make the right choice for your home. Schedule a free estimate in your area today!